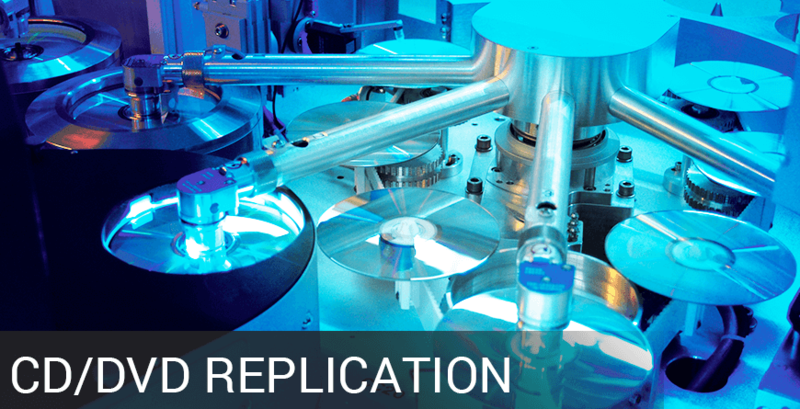 Replication is the actual manufacturing process of pressing Compact Discs (CDs) or Digital Versatile Discs (DVDs). It involves creation of a glass master that is placed onto a stamper which is then injected into a mold (shape of a disc) made from polycarbonate substrates. Data is then permanently stamped or "pressed" onto the CD or DVD and the end result is a fully manufactured disc that is playable across multiple platforms. CD/DVD Replication is most often used when mass production of a disc is required. Due to manufacturing overhead, a minimum quantity of 500 units maybe required but is generally more cost effective when producing volume runs. Depending on your quantity needed a replication process can take anywhere between 7-10 business days to complete a run. Coda, Inc. is a full service CD/DVD manufacturing plant committed to providing our customers with professional and quality replication at affordable prices. Our replication system uses specialized injection molding and finishing technologies to produce outstanding CDs and DVDs. These systems are capable of producing more than five million compact discs per year. Each CD-ROM title has a glass master that is stored in a vault so reorders are fast and easy. Coda, Inc. can help with every step of production regardless of the size and scope of your projects. CODA is Colorado's Direct CD Manufacturer! Understanding how replication works will help determine if this solution is the best fit in the planning stages of your projects. Pre-mastering is the first step in the replication process and a read-in diagnostic test is conducted before production of a glass master. At this stage various checks and balances are performed to ensure the source disc does not contain any errors or corrupt data. The next step is the creation of a glass master supplied from the original client master. 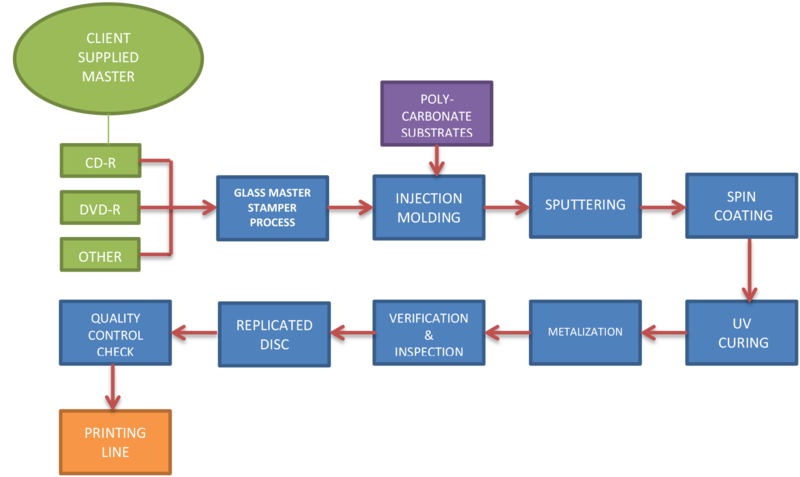 As you can imagine the glass master is made from glass along with specialized nickel-plated elements containing data that will be used to create the discs. The glass master process produces a metal stamper that is placed into the CD/DVD injection mold press used during the stamping process to replicate your image. The disc is made by injecting melted polycarbonate pellets into the mold. The data on the glass master is physically stamped or pressed into each individual disc, creating an exact replica. The data pressed onto the disc is permanent and once it is embedded no information can be removed or added. Afterwards, the discs go through a cooling process and are rapidly ejected from the mold. This process also includes two quality control tests conducted for each production run. From there it goes on to the metallization stage where a thin layer of aluminum is applied giving it a reflective appearance then coated with a lacquer for protection. Compact Disc or more commonly known as a CD is a digital optical storage format that allows you to hold up to 80 minutes of audio or 700 Megabytes (MB) of data. Standard CDs have a diameter of 12cm. CDs became popular in the 1980s and continue to be a primary format amongst musicians and other industries. CD Audio or CD-DA is part of the redbook standard and was originally developed to hold audio tracks only. Further development allowed text information (CD Text) to be included. On the other hand, CD-ROM was developed to hold a combination of text, audio and graphics. CD-ROMs have been and still is a preferred choice for software developers. CD-ROMs can only play in personal computer drives while CD-Audio is compatible with both PC and standalone CD players. Coda, Inc. can replicate both CD-Audio and CD-ROM in quantities starting from 500 and up. Digital Versatile Discs or DVD is another means for optical storage of data. Successor to the Compact Disc, DVDs hit mainstream in the 90s and can hold 7 times as much data than a CD. Standard DVDs also measure 12cm in diameter and because of its "versatility" DVDs provide superior picture quality and superb data life span. In fact, DVDs remain the preferred format for movie and home entertainment distributors. DVDs also have a huge consumer base in the software industry. Today there are four variations of DVDs that exist with different storage capacities ranging from 4.7GB to 17GB. The most common versions are outlined below. Single sided/ single layer; data is read from one side. A single-layer DVD or DVD-5 holds up to 4.37GB of data or approximately 120 minutes of quality digital audio and video. Even though it is labeled as 4.7GB some storage is reserved for computer and file system information. DVD-5s are the most popular and commonly used storage format on the market today. Coda, Inc. supports replication of this type of media format. Single sided/dual layer; data is read from one side. As the name implies a Dual Layer DVD or DVD-9 allows you store significantly more data than its single layer counterpart-up to 8.5 gigabytes per disc. With DVD-9, both layers of the dual-layered disc are read from the same side and may require compatible DVD players with special readers for playback capabilities. Double sided/single layer; data is read from both sides. DVD-10 or Double-side Single-layer is essentially a double sided DVD with layers on either side and has a total of 9.4GB of storage collectively. Each layer or side is equivalent to 4.7GB of data and consumers would have to flip sides to access one or the other. With this type of format there is no printing on the surface or is usually limited to the hub for labeling purposes. Double sided/dual layer; data is read from both sides. With the need for more and more storage space, the DVD-18 was developed. A single DVD disc, double sided with 2 layers on each side. Conversely each layer may store approximately 8 gigabytes of data on each side. Similarly to the DVD-10, DVD-18’s do not have a surface for printing and is also limited to the hub area for labeling. A Mini CD or DVD is a smaller disc that measures 8cm in diameter and holds less data than the traditional style CDs and DVDs. A mini CD or DVD is very useful when small amounts of data is required for storage. A mini CD holds up to 210 MB of data or approximately 24 minutes of audio while a standard mini DVD is said to hold 1.4 GB of data. Mini CDs/DVDs are also referred to as "3-inch mini" in reference to their diameter in inches. Custom manufactured mini discs have the same replication process as a full size 12CM disc. Each disc is injection molded to its finished size and data is imprinted using a stamper. Coda, Inc. has the capabilities to replicate both mini CD and DVD formats respectively. CD business cards is exactly as it sounds; a CD in the shape and form of a business card. These are often used by companies for promotional and marketing campaigns. Digital content can be added up to 180 MB and has loads of advantages in attracting attention. Coda, Inc. can also manufacture many custom shapes and unique sizes. There are several advantages when it comes to media replication but the greatest advantage of this process lies in its ability to mass produce a volume number of discs with consistent quality and premium results. If you are looking to offer your media through wholesalers, retailers or other means of distribution then you definitely will want to consider replication. CD/DVD replication is far more cost effective per unit if require quantities of 1000 and up. CDs and DVDs are major carriers of information and such storage mediums are easily accessible in today's marketplace. Utilizing a professional replication service ensures your product gains maximum visibility and sees that quality satisfaction standards are met. CD and DVD replication is the quickest and most economical way for multimedia reproduction and delivery. Almost any business, non-profit organization or private individual can use media replication to their advantage. Who can benefit from Media Replication? Whether you are a filmmaker that needs DVDs for a theatrical release, or an independent musician just finishing up recording on a new album or a corporate infrastructure getting ready to launch a marketing campaign, CDs and DVDs are vital tools to get your products into the hands of potential buyers. Using media replication remains an increasingly important choice to deliver your message across a broad spectrum. It can be used for instructional videos, product catalogs, multimedia presentations, inbound and outbound marketing, training manuals, education, audio books, gaming and much more. Regardless of its intended purpose, the benefits from media replication are endless! CODA continues to complete work for many industries across the globe. Why use Coda for Media Replication? Manufactured discs often have to abide by specific industry standards set by the International Organization for Standardization, better known as ISO to ensure consistent quality control and performance is met. Coda, Inc. conforms to ISO specifications and complies with all quality control procedures. Expect nothing less than premium quality and excellent craftsmanship! Coda provides value with over 100 man-years of business experience in the duplication industry covering sales, operations, and administration. Use our knowledge to your advantage so you can focus on getting your products to market successfully, over 320 customers do today and have since 1984. Every step of Coda's production process is based on OEM QC standards and guidelines ensuring your product and order specifications are completed beyond customer expectations. Our customers are the most valuable asset in our day-to-day business operations. That's why we are committed to putting "quality" at the front of our door step. We continue to offer competitive prices without the need of sacrificing quality products and services. Our replicated discs are guaranteed against defective materials and workmanship. In the unlikely event you are not happy with our products simply contact our Customer Service Department.